Eating out is no longer just about the food - it is an art form of the highest order. Diners look for a restaurant that envelops you in its magic and individual style and provides you with an eating experience that you'll be talking about for weeks on end. A meal in any of our featured Michelin starred restaurants is guaranteed to exceed your wildest gastronomic dreams. Alain Ducasse is the most successful restaurateur in the world, with fifteen more Michelin stars worldwide than Gordon Ramsay. His first London operation, earning him three of those stars, is a hyper-modern 80-seat dining room, fortunately tucked well away from the gaudy monstrosity that is the Dorchester's grill room. The menus are distinctively French, aiming neither for molecular wizardry, nor Ramsay's faux-simplicity, but for an imaginative mixture of old and new techniques, and a total dedication to the craftsmanship of cheffing. The current Parisian love affair with all things Japanese is also apparent. This is one of the most expensive restaurants in London but if you can afford to pay £100 a head, then you're guaranteed a pretty spectacular meal. Gordon Ramsay's level of celebrity has reached such a fever pitch that it has become very nearly impossible to get a table at the small restaurant that first established the belligerent ex-Rangers footballer as the biggest name in British food. If you do manage to get in, what you'll find is an absolutely excellent British restaurant, where subtle touches complement, but never drown, the excellent seasonal ingredients. There's some fantastic offal on offer for nose-to-tail eaters, but the menu also has plenty of simple, traditional options. Service is immaculate and if the decor is starting to date a little, this is more than made up for by the food. The only restaurant run by a British chef to have received three Michelin stars and you can certainly taste why. 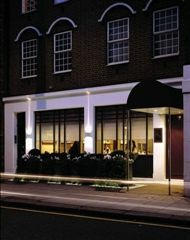 Following Angela Hartnett's departure from the restaurant at The Connaught hotel in Mayfair in 2007 the restaurant reopened with Helene Darroze as the two Michelin-starred Executive Chef from July 14th 2008. Great ingredients, often sourced from small producers, are the secret to a relentlessly inventive menu packed with star dishes. The lunch/pre-theatre menu is particularly good value, but the tasting menu is a once-in-a-lifetime experience. Like the hotel's stylish Coburg Bar, the design is by Parisian designer India Mahdavi. Ludlow's loss is London's gain as the two-Michelin starred Hibiscus moves to Mayfair. Relocating from Shropshire, husband and wife team Claude and Claire Bosi have decided to keep much of their previous restaurant - it's a winning formula so why change it? Everything from the menu right down to the artwork on the walls has been recreated, even the teapots and trays come from Ludlow. Tellingly, most of the staff have moved too. Sample dishes are another indication of their roots with Bosi intent on using Welsh ingredients; Elwy Valley lambs brain, Shropshire rose veal and choux farci of Welsh lamb come fresh from the Marshes and hill farms in the heart of North Wales. Prices too have remained at provinces levels which, when you transport them to London and compare them to their equivalents, suddenly seem very reasonable indeed. Ludlow maybe mourning their loss but we're thankful that the Bosis have chosen to close their original restaurant. Unlike so many chefs of this calibre whose name becomes a brand and who spread themselves thinly over their culinary mini empires, Claude can concentrate on getting this one right. Monsier Robuchon retired at the top of his game after being voted the chef of the century in 1990, but returned in the late 90s to open his chain of 'Atelier'. 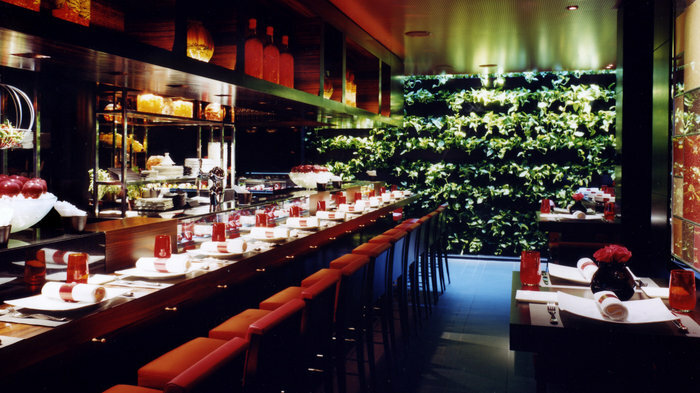 The London branch is the third, after Paris and Tokyo, and there are further sister restaurants in Monaco, Macao, New York, Las Vegas and Hong Kong. The London branch sticks to the formula of having no bookings, and offering some of the finest food in the world, worthy of two Michelin stars. The cuisine aims at 'simplicity' which means that ingredients are not overwhelmed by sauces. The decor, on the other hand, is nothing if not overwhelming, with great sweeps of foliage, and a central kitchen where you can sit up at the bar and watch your food being prepared. Mayfair Restaurants come and go but Le Gavroche never changes - the service remains the best in London, head chef Michel Roux Jnr is ever-present (a lesson for the Ramsay's and Rhodes' of the world) and the buttery-rich, classic French food continues to attain heights of gimmick-free perfection that flashy joints like Nobu can only dream of. The decor has changed very little since it was founded in the late 60s, and it continues to the thick carpet, heavy wood, gleaming silverware and green leather simply reek of luxury. The prices are absolutely eye-watering in the evenings, but the £48 three-course lunch is a good deal: it includes wine, water, coffee, canapes and a shorter, but otherwise equally good, menu. Expensive but brilliant. Superchef Marcus Wareing engages in daily feats of culinary magic in the opulent splendour of the Berkeley Hotel. Changing its name from Petrus and moving out from under the Gordon Ramsay banner in September 2008, nothing much at this two Michelin-starred restaurant has changed except the name. The décor - based on that at Chateau Petrus - is plush plum velvet and, like the menu, exudes dramatic glamour. The standards of food, drink, service and style are fully deserving of a two-star rating and, rumour has it, they're going for a third. Seriously superior. Pied à Terre won its second Michelin star in the 1990s. Head chef Tom Aikens departed soon after, taking his extravagantly weird cooking with him, but they have managed to remain one of London's half-dozen two-starred restaurants in spite of the fire that flambéed the dining room in 2004. That, at least, gave them the chance to redecorate, and the dining room is now younger and hipper than its previous staid incarnation, with smooth curves and big mirrors that reflect the gleaming cutlery. The menu is contemporary French, from the 'little-piles-of delicious things' school, where thin slivers of delicious things are stacked between scoops of foams and purees. Chef Shane Osborn has a delicate touch and offering dishes far less tough on the arteries than many restaurants of this quality - something he achieves without sacrificing a morsel of flavour. From cheap budget places to stay to luxury 5 star hotels see our deals for hotels, including DoubleTree by Hilton London - West End from 58% off.